Hemmed in on all sides by buildings that run the complete gamut of modern architecture from the 1960s to the ‘90s, is this postmodern enclave to a masterplan by Rob Krier. ‘De Resident’ stitches the low-rise of the old town centre to the high rises of the business district centred on The Hague Central Station. A new tram route from the station to the city hall compensates for the built-over tracks. 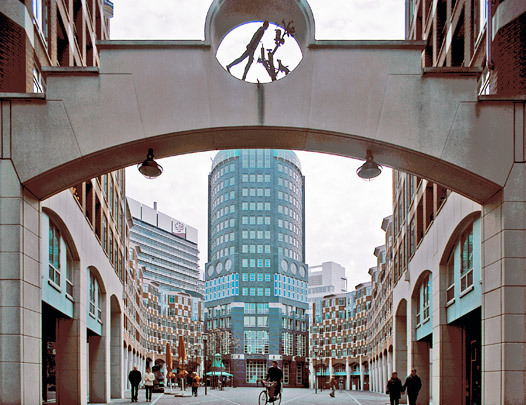 Once the area had gained a new diagonal axis and a horseshoe-shaped central public space, a team of name architects from home and abroad directed by Krier and Sjoerd Soeters was enlisted to design the panoply of high-profile buildings. Michael Graves tacked an ‘Old Dutch’ facade and two outsize pointed gable roofs onto the concrete frame of the Transitorium, a 1960s office tower constructed using the jackblock method. This and Soeters’ own trio of stepped towers together house the Ministry of Health, Welfare and Sport. Commandeering one end of the axis is Cesar Pelli’s 88 metre tall office tower for the Zurich insurance company. Krier himself designed the green Muzentoren, with Adolfo Natalini providing the housing around the new square (Muzenplein). Next on the urban planning agenda is the area centred on Carel Weeber’s Zwarte Madonna and the two mountainous blocks housing the Ministries of the Interior and Justice. These are to make way for more giant office blocks courtesy of Hans Kollhoff. Weeber’s De Zwarte Madonna (‘Black Madonna’) was torn down in 2007.